Co. Leitrim: Carrick-on-Shannon (2), Drumreilly (2), Drumsbambo (2), Drumsna, Kiltubbrid, Keskcarrigan (2), Leitrim. Co. Roscommon: Aughrim, Creeve, Elphin (2), Gillstown (2), Killglass (2), Killukin, Kilmore (2), Tumna. The Board also included 7 ex-officio Guardians, making a total of 30. The population falling within the union at the 1831 census had been 66,858 with divisons ranging in size from Drumsna (population 2,947) to Elphin (7,351). The new workhouse, built in 1840-42, was built on an 7-acre site to the east of the town. It was designed to hold 800 inmates and its construction cost £5,168 plus £1,032 for fixtures and fittings etc. It was declared fit for the admission of paupers on 1st July 1842 and admitted its first inmates three weeks later on 21st July 1842. The location and layout of the Carrick-on-Shannon workhouse are shown on the 1912 OS map below. Carrick-on-Shannon general view from the south-east, 2000. 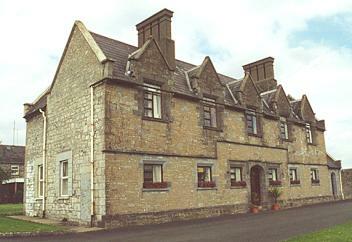 Carrick-on-Shannon entrance block from the south, 2000. Carrick-on-Shannon main block from the south-east, 2000. Carrick-on-Shannon suffered greatly during the famine years. By the end of 1846, the workhouse was bursting at the seams, with the inmates lacking food, clothing, proper sanitation, and having only straw for bedding. Diseases such as dysentery and typhus were rife and a dozen deaths a week were occurring. In an effort to provide additional capacity, coal and straw stores were fitted up to accommodate 50 extra inmates. 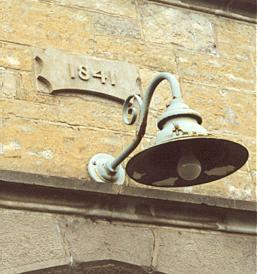 A 44-bed fever hospital was also erected to the east of the workhouse. I have already stated that owing to the want of funds, great difficulty exists in many Unions in providing for the inmates. The worst which I visited was that of Carrick-on-Shannon (which opened in 1842); it is in a miserable state and the doors were closed against further admissions; and although built for 700 had but 280 inmates; gates were besieged by seventy or eighty wretched beings who in vain implored for admission. Numbers of them were in various stages of fever, which was terribly prevalent in the neighbourhood, and the fever-shed overcrowded. Two months before my visit, the doors of the workhouse were opened and the inmates expelled, entailing upon them the most dire misery. In January 1847, the government introduced a number of direct relief measures including soup kitchens. 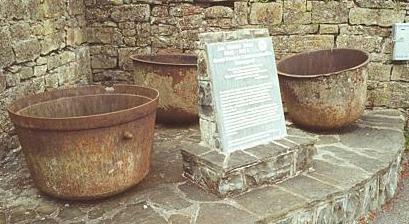 Carrick-on-Shannon - 'famine pots' from soup kitchens, 2000. In the light of complaints of maladministration on the part of the Board of Guardians, the Poor Law Commissioners appointed a temporary inspector, Captain Edmund Wynne to administer the workhouse more efficiently. Following their refusal to co-operate with Wynne, the Board of Guardians was disbanded and two Vice-Guardians, James O'Reilly and Robert Duncan, were appointed in their place. I have the honour to acknowledge the receipt of your letter of the 22nd instant, relative to the agricultural prospects in my district. In many electoral divisions I regret to say the prospect is anything but cheering, while in some there is nearly an average breadth of corn (for this country), and very great anxiety to plant the largest amount of potatoes their means of purchasing seed will admit of. The breadth already planted in the district, with the exception of the Electoral Divisions of Carrick, Elphin, part of Killucan, and part of Drumsna, is not considerable. The great obstacle will be found the procuring of seed, as this district produced scarcely any potatoes last year; and the small portions that now remain are of the worst description, scarcely to be depended on for seed, from their not having ripened sufficiently. Our market is supplied from the coast and parts of Mayo, where the potatoes did comparatively well last year. The market price here is 40 per cent. higher than in Swineford or Ballaghaderreen. I have no doubt but. that if a facility of procuring seed were afforded, an average crop of potatoes might be reckoned on in the greater portion of my district. There is at present available two years' manure, not however twice the quantity of ordinary years, as last year manure was not collected with as much industry as if the prospect of the potato crop had been different, but there is a large quantity available at this moment. I do not think it will be found possible in this Union to organize a committee to enable us to take advantage of the opportunity of procuring seed which the Central Committee holds out. I have however done all in my power to promote its formation. In the mountain districts some oats will yet be sown, and some barley in any land which may be suited to that grain; but I do not expect that the amount will be any thing considerable. I do not think that any turnips will be sown if potatoes can be procured for seed. The corn crops wherever over ground appear healthy though backward, but from the temper of the soil and climate such is always the case. In September 1849, following a complaint made against him by a former Guardian and local landowner, Wynne was replaced by Captain Philip Haymes and in December 1849, the Board of Guardians was reinstated. The Board compiled and submitted a report to the District Inspector on how the workhouse had been administered in their absence, following which all the workhouse officers with the exception the clerk were dismissed. The various charges made against Captain Wynne and the Vice-Guardians were eventually investigated by a select committee of the House of Lords with 27 witnesses from Carrick travelling to Westminster to give evidence. Ultimately, the substantive charge against Wynne was for giving financial assistance from the Union to one Catherine Foley, with whom he was having a relationship, to help her emigrate. At the 1901 census the population of the Union was 19,280. Following the reorganization of the workhouse system in Ireland after the formation of the Irish Free State in 1921, Carrick-on-Shannon continued in its role as a refuge for the destitute until the 1930s, then became a geriatric hospital. It now serves as St Patrick's community hospital focusing on care of the elderly. In 1997, the Carrick-on-Shannon and District Historical Society commemorated the 150th anniversary of the depths of the famine, when soup kitchens were introduced to try and help relieve the starvation conditions. They also aim to renovate the adjacent famine graveyard and recreate a small part of the workhouse in one of the hospital attics which has survived virtually unchanged since the nineteenth century. 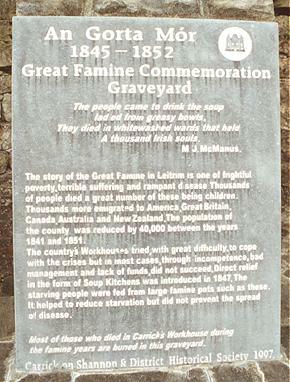 Carrick-on-Shannon - famine graveyard commemorative stone, 2000. Leitrim County Library, Main Street, Ballinamore, Co. Leitrim. Holdings: Union minute books (1843-1919, some gaps); Rough minute books (1854-55, 1899); Accounts (1843-94, major gaps); Abstracts of rates: (1896-98).